Chiefs Fortune Slot Game was released November 1999 by Microgaming. The online slot game has 3 reels and 1 pay line. The graphic design of Chiefs Fortune shows a tribe of Native American Indians gathered up to give thanks to Mother Nature for the wonderful things they have been given for the season, and to simply ask Mother Nature to give them rain in order to help them with the drought season (by performing a rain dance). Various colors used in the slot game include blue, green, purple, red, orange, yellow, black and white. The background music in this game resembles the music from customary Native American Indians’ celebratory dances, accompanied by hooting sounds and merry cries of its dancers. Whenever reels spin and get winning combinations, simple sounds common in land-based slot games is heard. When player get the Arrow symbol, he will hear the sound effect of an arrow shot in the air and twanged when it landed on the wooden target. The regular symbols in Chiefs Fortune are the 3-Bar, 3-Bar, 1-Bar, Red Seven, and the Chiefs Fortune Logo. The Wild Symbol is the Chief himself. It acts as a substitute for all other symbols (except for the scatter symbol) in order to help you complete a winning combination. The Chiefs Fortune slot machine game features Wild symbols, and a Chiefs Fortune Bonus Feature game, where you can win up to 600 credits. The Chief symbol in the Chiefs Fortune slot game is a wild symbol. This means that the Chief wild symbol acts as a substitute for other symbols to complete winning combinations. 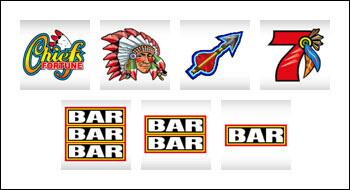 Multiple Chief wild symbols on an enabled payline create winning combinations, as shown in the "Regular Payout Schedule". The Chief wild symbol does not substitute for the Magic Arrow symbol or to activate the Chiefs Fortune Bonus Feature game. The Magic Arrow symbol in the Chiefs Fortune slot game is a scatter symbol. The Magic Arrow scatter symbol only appears on reel 3. The Magic Arrow symbol is displayed on the payline awards you one Magic Arrow. Collect five Magic Arrows to activate the Chiefs Fortune Bonus Feature game. The Chief wild symbol does not substitute for the Magic Arrow symbol or to activate the Chiefs Fortune Bonus Feature game. The Magic Arrow symbols do not grant any winnings, but they enable player to enter the Chiefs Fortune Bonus Feature game after he have collected five Magic Arrows. The Magic Arrow scatter symbol only appears on reel 3. Player can win up to 600 credits in the Chiefs Fortune Bonus Feature game. To qualify for the Chiefs Fortune Bonus Feature, player must wager three coins per spin. If player bets one or two coins and the Magic Arrow symbol is displayed on the payline, he is not awarded a Magic Arrow that's needed for the Chiefs Fortune Bonus Feature. If player bets three coins, and the Magic Arrow symbol is displayed on the payline, one Magic Arrow is shot into the target. Once player have collected five Magic Arrows the Chiefs Fortune Bonus Feature game is activated. When a Magic Arrow is received it is stored until player has collected all five Magic Arrows required to enter the Chiefs Fortune Bonus Feature game. The Chief wild symbol does not substitute for the Magic Arrow symbol or to activate the Chiefs Fortune Bonus Feature game. Player will not lose the Magic Arrows collected when he exits the Chiefs Fortune slot machine game. Random articles of clothing worth various Bonus Prize amounts will be revealed. Total Bonus Prize win amount is counted in the bonus Win box. When the Chiefs Fortune Bonus Feature game is complete, player is returned to the regular Chiefs Fortune slot machine game and Bonus Prize game wins are added to the win total. The theme of Chiefs Fortune is inspired by the traditional rituals performed by Native American Indians such as the rain dance. In the later days of August when the land is very dry, Native American tribes in the Southwestern United States perform a rain dance. Up to this day, this ritual is still performed by men and women who wore special clothing and headdresses. Goat hair was put in the headdresses and any object having a blue color (signifies the wind and rain) such as turquoise is put in their clothes. Every year, these special clothes were worn for the rain dance. The maximum jackpot payout in the regular Chiefs Fortune multi-coin slot machine game is 2,000 coins. Regular winning combinations pay out from left to right (Reel 1-3) in consecutive order except for the Magic Arrow scatter symbol. At least one of the symbols must be displayed on the first slot reel. A symbol combination starting from the second or third slot reel does not pay out. Winnings paid out on the Chiefs Fortune Slots are dependent on the symbols displayed on the payline, once the reels have come to a stop.